Austin Hendrix performing at the Encyclopedia Show: Somerville. Photo by Alex Barstow. Austin Hendricks has only ever done art by accident. 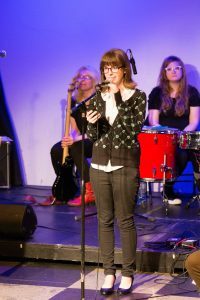 She stumbled into the Boston Poetry Slam at the Cantab Lounge on her twentieth birthday after googling ‘POETRY SLAM BOSTON.’ Despite being asked to judge a slam on her first visit, she has continued to return again and again, presumably because she likes this “poetry” thing. Present day, she can still be found there on most Wednesdays as a regular on the open mic, fact-checking everyone’s metaphors. While an undergraduate at Northeastern University, she was president of the Creative Writing Society and organized a number of writing-related events, culminating in a poetry reading series in collaboration with the NU English Department. After graduating, she decided she wasn’t done organizing and asked to take over curating Moonlighting, Boston Poetry Slam’s LGBTA+ reading. You may reach her at austin@bostonpoetryslam.com.